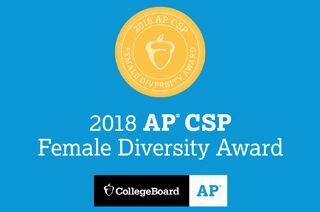 Immaculate Heart High School has earned the first College Board AP® Computer Science Female Diversity Award by engaging more young women in computer science coursework in AP Computer Science Principles. Out of more than 18,000 secondary schools worldwide that offer AP courses, Immaculate Heart is one of only 490 to achieve this result in 2018. Immaculate Heart introduced AP Computer Science Principles three years ago under the direction of Megan Reeves, chair of Immaculate Heart’s computer science department and the director of educational technology. Student interest in the class has grown ever since. Along with AP Computer Science Principles, the high school now offers Advanced Topics in Computer Science as well as Introduction to Computer Science, which became a graduation requirement starting with the Class of 2022. All are currently taught by IH alumna Laurence Toal, Class of 2010, who holds undergraduate degrees in computer science and political science from Wellesley College and graduate degrees in international relations and research politics from the University of Edinburgh. 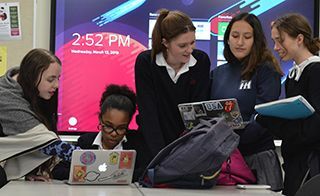 “By inviting many more young women to advanced computer science classrooms, Immaculate Heart has taken a significant step toward preparing its students for the widest range of 21st-century opportunities,” said Trevor Packer, College Board senior vice president of the AP Program. Providing female students with access to computer science courses contributes to gender parity in the industry’s high-paying jobs and drives innovation, creativity, and competition, Parker added. Computer Science instructor Laurence Toal guides students as they design interactive application prototypes for Introduction to Computer Science, one of Immaculate Heart’s computer science offerings.